German notary and secretary of the Reform congregation of Hamburg; born 1785 (? ); died in Hamburg Dec. 25, 1839. He was identified with the Reform movement in Hamburg from its beginning, and when the Orthodox party attacked the Hamburger Tempelverein in the pamphlet "Eleh Dibre ha-Berit" (These Are the Words of the Covenant; Altona, 1819), Bresselau wrote as a reply his polemical work, "Ḥereb Noḳemet Neḳam Berit" (A Sword That Revengeth the Quarrel of the Covenant; Dessau, 1819). 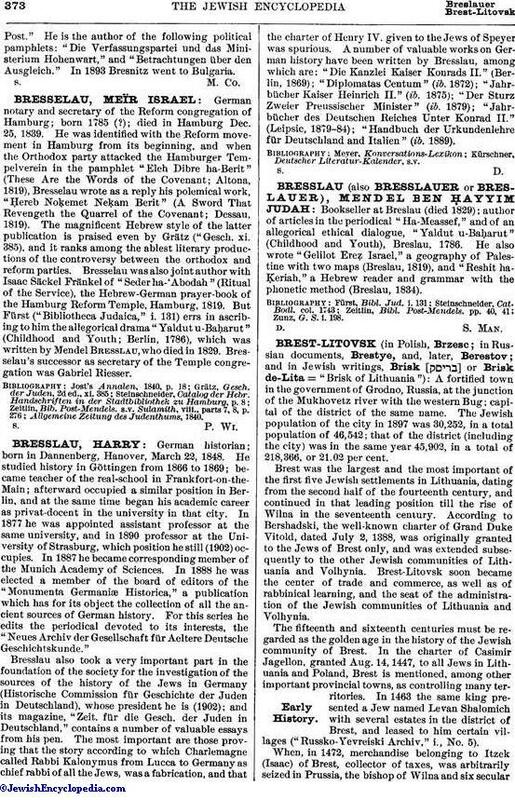 The magnificent Hebrew style of the latter publication is praised even by Grätz ("Gesch. xi. 385), and it ranks among the ablest literary productions of the controversy between the orthodox and reform parties. Bresselau was also joint author with Isaac Säckel Fränkel of "Seder ha-'Abodah" (Ritual of the Service), the Hebrew-German prayer-book of the Hamburg Reform Temple, Hamburg, 1819. But Fürst ("Bibliotheca Judaica," i. 131) errs in ascribing to him the allegorical drama "Yaldut u-Baḥarut" (Childhood and Youth; Berlin, 1786), which was written by Mendel Bresslau, who died in 1829. Bresselau's successor as secretary of the Temple congregation was Gabriel Riesser. Allgemeine Zeitung des Judenthums, 1840.